Nothing to spectacular to write tonight. Just another day out in the Portland wine market pouring my 2009 Vincent Pinot Noir Eola-Amity Hills wine for buyers at New Seasons and Whole Foods Markets. Some success. New Seasons Hawthorne is bringing it in, as is New Seasons Happy Valley. No word on the other stores I visited, and because most of the stores don't really make appointments, just have drop in times, sometimes you wait your turn. Sometimes there isn't anyone there or they just went to lunch. Sometimes they've already left for the day even though you're not done with yours. Which is to say, a typical day selling wine. Some success, some failure, no outright rejection, sure, but a lot of work to get two sales. But I'm not discouraged. A friend heard the news and was so excited for me, it jarred me for a moment to realize that, yes, I'm doing what I love and having success. How could that be anything but great? Oh, and both of those New Seasons stores want to bring me in for in-store tastings, which I'm still new enough at this to be really excited about. My goal is really to get lots of people who don't know what I'm up to, making what I believe is really good Pinot Noir in the city of Portland, OR, to know what I'm up to. And pouring and being able to tell everyone out there on the interwebs that I'm gong to be pouring, isn't a bad way to start. Next up, more time in the market hitting lots of stores I still haven't gotten to, and the few I hit today unsuccessfully. You interested to hear more about how this all turns out? I was turned on to the Quattro Mani wines this past year by Michael Alberty of Storyteller Wines in Portland, OR. The label means "four hands" in Italian, and is a partnership of (I think) four producers. Really, I've tried three and even the website of the importer, Domaine Select Wine Estates, suggests there are only three bottlings, so far anyway. The story they list says things started in 2006 with a Quattro Mani bottling of Montepulciano d'Abruzzo made by Attillo Pagli, followed by a white in '08 and a sparkling wine in 2010. I've tried examples of all three, the current releases I believe, and they are all excellent and excellent values. The current red is the 2009 Quattro Mani Montepulciano d'Abruzzo, perhaps the perfect pizza wine. Dark crimson, fresh and fruit-centered but clearly Italian with a classic bitter chocolate and almond dryness to complement the fresh mixed berry fruit flavors. There's fresh acidity and some tannin, just enough to keep things interesting. This isn't sweet, cocktail wine. Some might find it too dry. I love it, find it pairs deliciously with food, refreshing the palate with each sip, yet is fruity enough to satisfy anyone who at least would be interested in something like Chianti in favor of generic merlot. Locally at $9, ridiculous value. The white I tried last was the 2008 Quattro Mani Toh-Kai made by the geek-famous Slovenian producer Movia, of some orange wine and esoteric sparklers. Stealing from a Storyteller newsletter, the producer is actually right on the Italian border, the label not reading Tocai because of EU rules to protect Hungary's Tokaji branding. So Toh-kai and another incredible value, and I'm sure the '09 will be if it's out now. Classic Tokai Friulano from NE Italy, full and crisp at once, slightly honeyed and spicy, floral, interesting but also easy to drink if you're not thinking about it. Great in summer weather. But the most interesting Quattro Mani wine I've tried is something I wrote about recently in my post on the Portland restaurant Nostrana. It's the NV Quattro Mani Franciacorta Brut, from a region that is Italy's answer to Champagne (meaning it's good but nowhere near Champagne...what is?). Franciacorta apparently used to be the insider's place for great value, serious sparkling wine. Now prices have risen, but here's an excellent bottling for less than $20. I tried it once at Storyteller, immediately bought a bottle. Then tried it at Nostrana, thinking I probably wouldn't have the same reaction. You know when you like something, then try it again and think...eh, what's the big deal? Not here. This has all the finesse, mineral and brioche notes of fine Champagne. Ok, maybe a different profile. Again, there is no substitute to Champagne. But this wine is rich and fine at once, delicate but full, that magical balance you want in most wines. Not too light, not too heavy, just right. And at a price where you might find it be the glass, where you won't be cutting any corners to order it. Terrific wine, terrific value. That's Quattro Mani. Three-fourths of it anyway. Still searching for that fourth wine. Any leads? The Armstrong vineyard gang met Friday night at Red Hills Provincial Dining in Dundee, OR, for the second annual dinner of grower and producers. Our Vincent Wine Company label sources from Armstrong, up on Ribbon Ridge, along with Seven of Hearts, Ayres and, starting in 2011, Aubichon. Good company for Vincent to be in, for sure. This year the dinner was especially notable because three of us brought barrel samples from 2010 from the first fruit harvested at this new site, which is owned by Doug and Michelle Ackerman. It's too early to say much about the wines, and I'm obviously too close to be fair. But I'd be lying if I said I wasn't excited. Last year, the site produced a small crop of nicely ripe fruit, and though the wines are still unfinished, everyone's samples showed great potential. Mine was the lightest in color but I like how expressive the wine is. We will see how things continue to evolve. After quickly tasting through the barrel samples, we moved on to the main event. 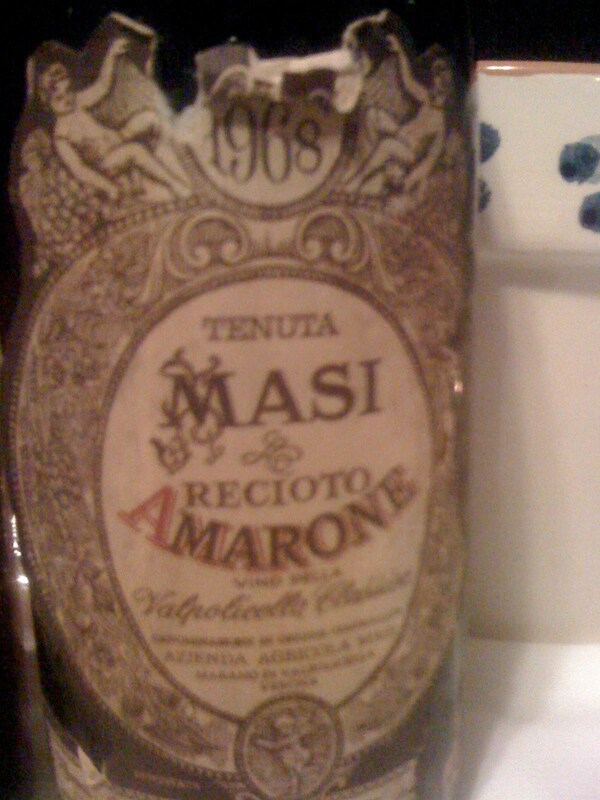 A mix of other wines, several older ones including a stellar Amarone Recioto from the 1960s. My favorite white wine was a 2005 Vincent Dauvissat Chablis 1er Cru "Vaillons" that was archetypal young Chablis. Greenish in the glass, strongly mineral with good weight, precise acidity and lovely seashell flavors. This will age nicely but was delicious with crab cakes. I saved and savored some for my main course of seared scallops. Others ordered things like short ribs or lamb shank or mushroom pasta, so reds were fittingly our focus. 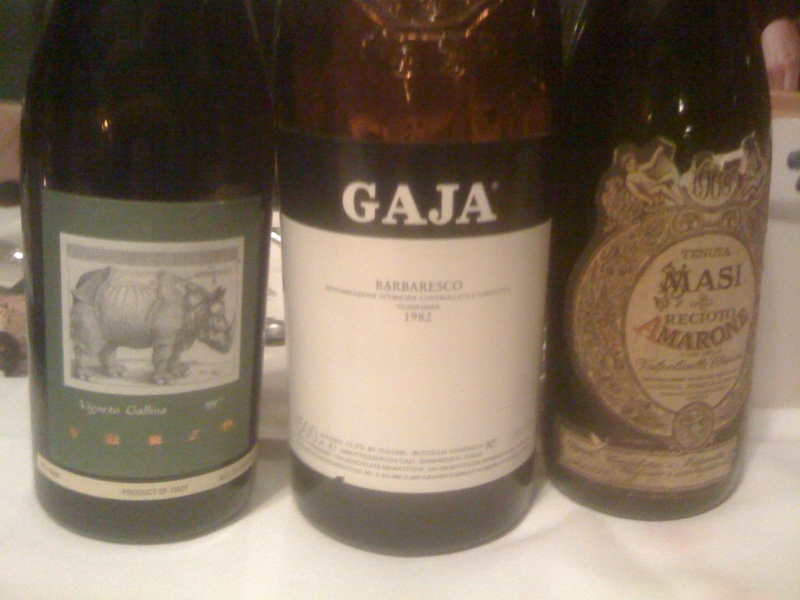 Highlights there included a magnum of 1982 Gaja Barbaresco, generously opened by the Ackermans. What lovely old Piemontese red, mature with some pleasant oxidation and hard to describe earthy aromas and flavors, this was old school nebbiolo all the way. Translucent, perfumed, bottle sweet, just terrific wine that held up pretty well over the evening. I brought the 2000 Confuron-Cotetidot Vosne-Romanee 1er Cru "Les Suchots" that showed pretty well. A bit more mature than 11 years might suggest, though I think 2000s are probably in their peak window these days. Fragrant, spicy, very Vosne, a little hard in the mouth though, not as resolved as the nose suggested. My only complaint. This was delicious red Burgundy. Back to Italy for the 1997 La Spinetta Barbaresco "Vigna Gallina" that, I'll admit, was my favorite dry wine of the night. Incredibly aromatic, more modern, sure, but clearly Piemontese nebbiolo. The aroma was so nice, something you could smell all night and never tire of. Dark fruit, subtle oak, then fennel and other spicy aromas. Full and rich in the mouth but not heavy, tannin rounded as you find with more modern Piemontese red, but I can't complain. A little barrique flavor on the finish, but this is outstanding wine. The perfect answer to people (like me) who sometimes get a little dogmatic about how old school is always (always!) better than the new school. There were some other notable reds, but I didn't pay enough attention to them. A rich, stony 2004 Janasse Chateauneuf du Pape Vieilles Vignes, a ripe but not overdone 2003 Relagnes Chateauneuf du Pape Cuvee Vigneronnes, and an herbal and not quite up to task 2004 Neudorf Pinot Noir Mouterre from Nelson in New Zealand (another from me). Really, I was focused on another incredible wine opened by the Ackermans. 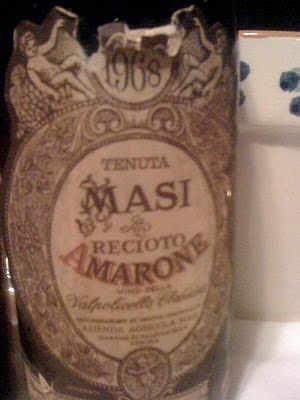 The 1968 Masi Amarone Recioto di Amarone, a wine that's one year older than I am and was so youthful, so delicious that I wouldn't have guessed it was older than 20 years and would still call it one of the most delicious wines I have had in recent memory. The perfect balance of savory and sweet, with little sugar sweetness but lovely, sweet aged fruit, no volatility, just perfectly integrated plum, tar, bitter chocolate, you name it, just incredible flavors, length, texture. Really, what great wine and great aged wine is all about. I am incredibly fortunate to have tried it. Thanks Doug and Michelle. In all, a delightful night in Red Hills' Craftsman house of a restaurant. The service area in the living and dining rooms. Fir flooring, dark beams lining the ceiling. Almost perfect, which is no complaint, just truth. Provoking thoughts of the future. We promised to do it again next year and, even with the uncertainty of this year's growing season ahead of us, I'm sure it will be even better then. The future is bright indeed. Nostrana in SE Portland is one of my all time favorite places to eat. It's terrific. Cathy Whims is well noted as a top chef in this city and beyond. The pizza oven cranks out incredible pies. The room, though large and potentially cavernous with high, exposed beams, is surprisingly intimate and comfortable. And...I've had a few meals here that were particularly special to me. So I jumped at the chance to eat there the other night when a friend - a fellow dad (our kids are friends) and wine industry vet (he generously helped with my last open house) - suggested we stop in after checking out a middle school open house for our daughters. The open house didn't work out for me, but the real draw was Nostrana. 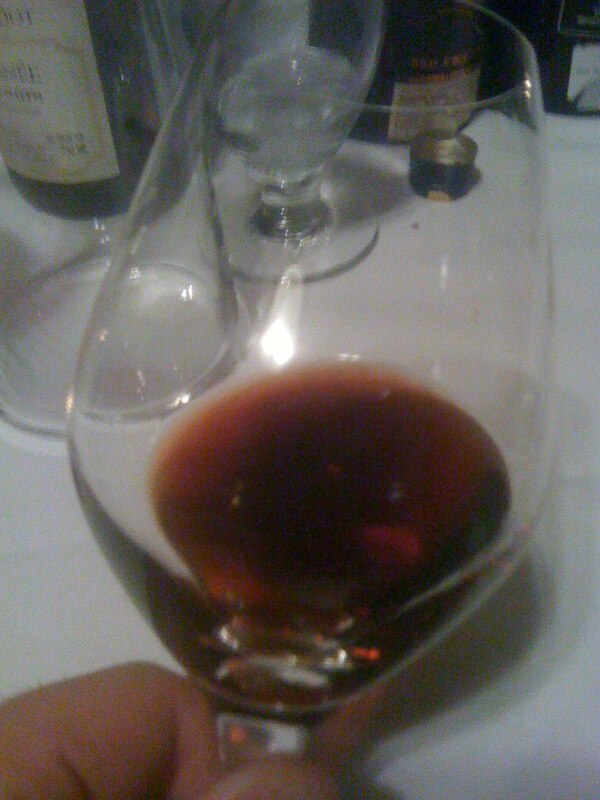 And as it turned out, the 2007 Vietti Langhe Nebbiolo "Perbacco." I started with a glass of bubbly from the Quattro Mani project, this a Franciacorta from NE Italy that's tremendous sparkling wine and a great value. The real story was the Perbacco. I've enjoyed this lower end Vietti bottling in the past, and noticed Antonio Galloni's glowing reviews of this wine in the Wine Advocate and on Grape Radio. Galloni says it's made just like all the fancy Barolo and Barbaresco in Vietti's cellar, just aged less and bottled earlier. This wine delivers on that promise. We each ordered the Insalata Nostrana, rich with garlicky Caesar dressing and parmasean over raddichio. My friend immediately commented that the Perbacco seemed more Barolo than Barbaresco, darker fruited and surprisingly good with salad. Then came the pizzas, mine with herbs and sausage and an egg cracked right into the middle of the pie. The wine seemed a little more floral and high toned in this setting, still more modern in flavor, dark and rich but clearly nebbiolo with rounder tannin than most wines at this eschelon. The food was fantastic and we talked about lots of things guys talk about. The wine was delicious, something I wouldn't think to put in the cellar but for the money it's really hard to argue with. Less traditional the Produttori di Barbaresco's Barbaresco normale, but a nice change of pace and clearly of its place. There's no mistaking this for anything but Piemontese nebbiolo. Think about it if that sounds interesting, and give Nostrana a try if you're in town. It's that good.